Vibration analysis is often used by reliability specialists to monitor the dynamic motions of machine components. Likewise, oil analysis is performed to examine the composition of fluid constituents. However, neither technique checks the actual lubrication of tribological systems in operation. This article will explain how sonic and ultrasonic stress wave analysis can extend vibration from mechanical to tribo-mechanical condition monitoring, thereby covering important gaps between vibration and oil analyses. Sonic stress waves detect forceful events, while ultrasonic stress waves identify slip events. 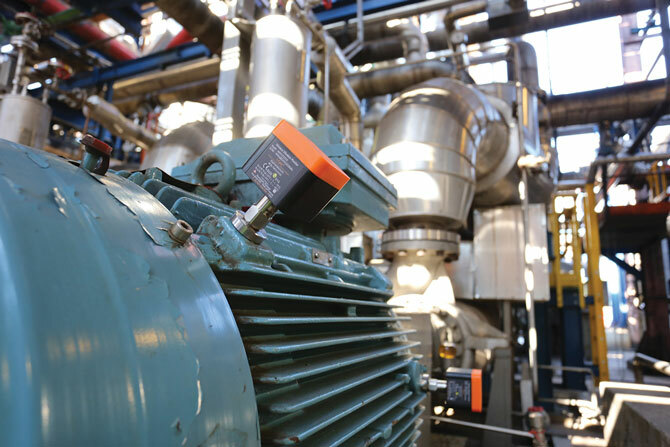 Modern vibration analyzers convert analog vibration signals into an oversampled digital data stream. Digital data is normally sampled at high ultrasonic rates. This high-frequency digital data is decimated to a much lower maximum frequency based on the running speed of a mechanical component. Traditional decimation is effective for extracting sinusoidal motion, rotation, displacement and resonance of machine components. Intelligent decimation operates on the original high sampling rate data before arbitrary decimation processes destroy the high-frequency content. 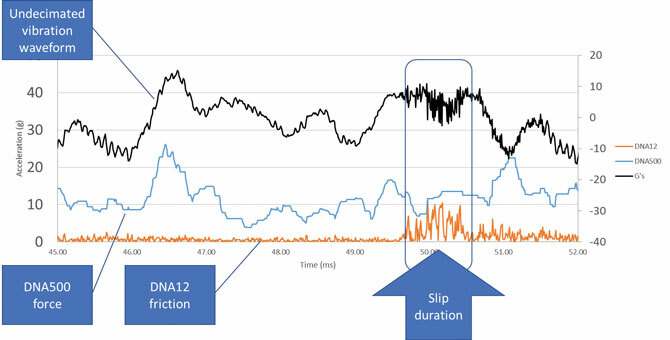 This stress wave analysis technique quantifies time-domain events such as impact, bearing and gear defects, slipping, rubbing, severe sliding, mechanical friction, and electrical arcing. 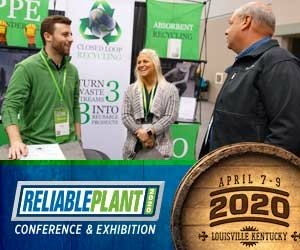 It can supplement traditional vibration analysis for rotating machinery and be a primary technique for other equipment types, such as slow-moving, reciprocating, articulating and high-voltage equipment. The intelligent decimation numerical algorithm (I-DNA) creates sonic and ultrasonic maximum peak detection stress waveforms for analysis. Event stress waves originate from a point of contact or compression and propagate through metals or fluids at the relative speed of sound, carrying information about the events that created the stress waves. The sonic range waveform (DNA500) exposes forceful acceleration events including rolling, compression and severe sliding, while the ultrasonic range waveform (DNA12) reveals friction-related events such as slipping, polishing and rubbing. The maximum DNA500 and DNA12 values, along with the ratios of DNA12 and DNA500, can reveal tribological characteristics from mechanical systems in relative motion. 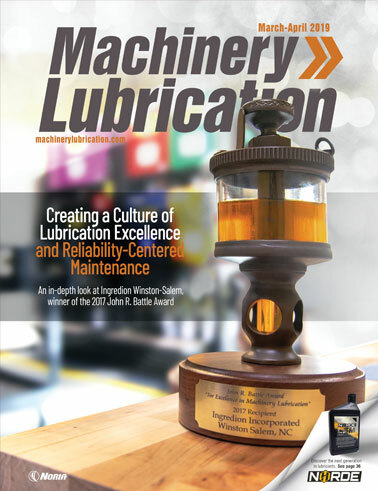 The life of machine components is largely dependent on effective lubrication. Besides dry contact between components, there are four different lubrication regimes: boundary, mixed mode, elastohydrodynamic and hydrostatic hydrodynamic. Based on the load, speed, lubricant and other factors, equipment designers may select 100-micron-thick, fluid-film hydrostatic and hydrodynamic planar bearings or 1-micron-thick, fluid-film elastohydrodynamic roller bearings. The duty cycle for machine operation may occasionally fall into a mixed mode or boundary lubrication regime, such as when the speed is very slow, the temperature is high, or the load is extreme. Since mixed and boundary lubrication provide only partial separation between moving parts, extreme-pressure (EP) and anti-wear (AW) additives may be required for optimum component performance in these conditions. Slip friction under dry contact is essentially the coefficient of sliding friction. Dry slip, boundary slip and mixed-mode slip lubrication regimes are preferable to the alternatives where much higher stick-friction forces lead to severe sliding, galling and adhesion, which can cause extreme heating and plastic deformation of metal surfaces. These slip-friction events can be revealed by an ultrasonic DNA12 value that is greater than 25 percent of the sonic DNA500 value. Alternatively, plastic deformation events typically do not slip, so the DNA12 value is less than 25 percent of the DNA500 value. Ultrasonic stress waves originate when asperities and grain boundaries slide across one another during slip motion. This occurs under boundary and mixed-mode lubrication regimes where the solid surfaces are so close together that appreciable contact between the opposing asperities is possible. Compression is the normal function undertaken by most rotating machinery components. Whether dynamic or static, compression loading transfers forces from the roller to the race or from the shaft to the journal. This is how most work gets done in rotating machinery tribosystems. The forceful compression is transferred from one solid element to another through the lubricant film by a hydrostatic, hydrodynamic or elastohydrodynamic lubrication regime. When operating within the design conditions, compression loading is passed from one member to the next while the fluid film separates the load-bearing surfaces, thereby avoiding wear and minimizing friction and shear. At times, the interfacial shear load transfer is normal. However, in other systems, the shear load transfer can be a serious problem leading to shortened component life. This is especially true for reciprocating pistons, slides, glides, thrust bearings and journal bearings. Again, hydrodynamic and hydrostatic lubrication regimes enable long life through a component separation boundary enabled by fluid film strength. Articulating and reciprocating machines are difficult to monitor using traditional vibration analysis due to the perpetual direction, speed and timing changes of the duty cycles. For many of these tribosystems, oil analysis must be used alone without the benefit of vibration analysis. Bearings and gears are designed to transfer compression through the fluid film. 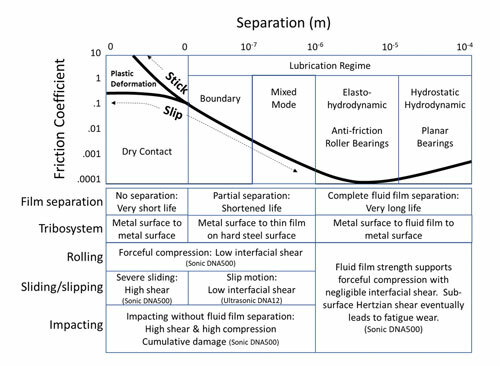 Shear must be effectively eliminated by the fluid film to avoid failure progression. 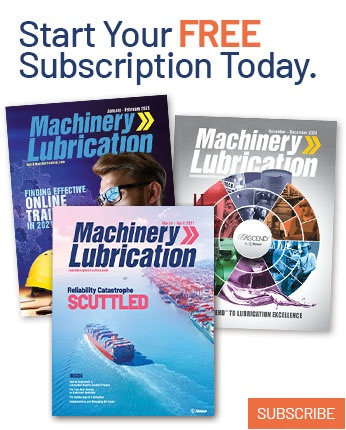 Inadequate lubrication, beginning with slip friction, is the primary interfacial shear culprit for these tribosystems. Using hardened steel on at least one side of an interface is a common practice for achieving low friction and low shear, as well as tolerance for occasional interfacial shear. The addition of extreme-pressure or anti-wear additives to load-bearing surfaces can also greatly improve component life, reduce friction and lower shear. 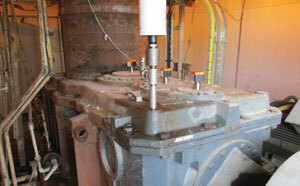 Inadequate lubrication is a widespread problem with many root causes. It generally means the film strength has broken down, enabling metal-to-metal contact. Common root problems that lead to inadequate lubrication include insufficient lubricant, low viscosity, slow speed or excess load. Insufficient lubricant may involve no lubricant, low oil, cold temperatures, incompatible substances or foaming. An empty oil compartment has obvious consequences. Improperly filled or leaking sumps can starve a slinger ring, pickup tube or splash-lubrication system. Cold oil is difficult to pump and may not drip while viscosities are elevated. Grease mixing is a significant problem when the resulting substance does not lubricate well. Foam will not transfer heat, and air does not lubricate. The remaining hot oil also degrades, varnishes and provides poor lubrication. Low viscosity can lead to inadequate lubrication as well. It is often caused by misapplication (wrong oil), dilution or an elevated temperature. A viscosity change may indicate the use of an incorrect or potentially ineffective lubricant. Dilution of the lubricating oil by low-viscosity substances such as fuel or entrained gas may result in the viscosity dropping below what is needed to support hydrodynamic or elastohydrodynamic lubrication. 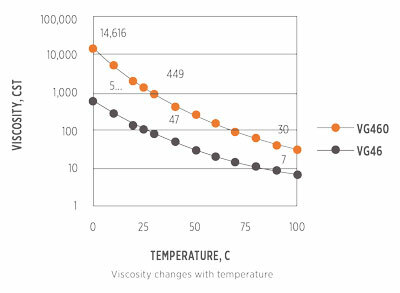 A temperature change will exponentially affect lubricant viscosity. For every 10 degrees C that a machine operates above normal, one step in the viscosity grade (VG) is needed to sustain adequate lubrication. Slow speeds may be unavoidable. Some hydrodynamic-lubricated machines use hydrostatic jacking oil to lift the shaft while it is getting up to speed. Other machines must simply get up and go, and sometimes they must later slow down and stop. It is similar to starting or stopping a speed boat with a skier in tow. When the boat is not moving, the skier doesn’t stand on the water. Slow speeds happen, and when they do, the lubrication regime changes from hydrodynamic or elastohydrodynamic to boundary and mixed modes. This temporary condition may work for a while, but eventually it will lead to surface damage. Extreme-pressure additives function well on hardened steel surfaces to minimize shear and avoid the onset of galling and severe sliding wear. Compression loads are supported by the lubricant film strength. This film strength is powered by the fluid and machine speed. While a high load with a high speed can be acceptable for a certain amount of time, as can a high load with a high viscosity, galling can result from a high load with a slow speed. Likewise, a high load with a low viscosity can lead to severe sliding. In tribosystems, there are many causes of excessive loading, such as the equipment’s design, operation, twist, torque, misalignment, component damage, etc. Inadequate lubrication of machine components in relative motion can generate slip friction, rubbing wear, galling, impacting and severe sliding wear. Slip friction and rubbing wear typically produce broadband ultrasonic stress wave energy. Galling, impacting and severe sliding wear are forceful events which produce strong sonic stress waves that appear overwhelming in comparison to the ultrasonic activity. Slip friction can be a telltale sign of inadequate lubrication. Rolling-element bearings are multi-element tribosystems with many rollers, two races and one cage. For elastohydrodynamic lubrication between the rollers and races, the required fluid film thickness is approximately 1 micron. For hydrodynamic lubrication between the rollers and cage, the necessary fluid film thickness is approximately 100 microns. Therefore, inadequate lubrication shows up first in the cage. Since the loading between the roller and cage is very light, ultrasonic stress waves may reveal slip friction before the onset of physical damage. Properly lubricated tribosystems are buoyed by lubricant film strength. Static and dynamic compression loads are transferred between adjacent components. Interfacial shear forces are rendered insignificant by a strong lubricant film. Under these conditions, the DNA500 waveform reports a strong acceleration score corresponding to machine dynamics, while the DNA12 acceleration score remains well below 25 percent of the DNA500 acceleration score. Slip happens when two surfaces contact each other at different speeds without a fully developed lubricant film. Essentially, it means no metal-to-metal galling or adhesion is taking place during engagement. As a result, the coefficient of sliding friction is low (less than 0.1), surface damage is very slight and at least one of the surfaces is normally hardened steel. Therefore, there is negligible galling or severe sliding, although mild rubbing and polishing may occur. Under these conditions, the DNA12 score intermittently exceeds 25 percent of the DNA500 acceleration score. Sliding and impact contact is a damaging condition resulting from inadequate lubrication under compression. Surfaces are gouged and striated. Extremely high temperatures may smear, melt, and discolor wear debris and surface materials. Under these conditions, the DNA500 score is very high with impacts lasting several milliseconds. During these intervals, the DNA12 scores remain well below 25 percent of the DNA500 acceleration score. Cavitation, fluid turbulence and electrical arcing are occasional sources of ultrasonic vibration in industry. Cavitation results from bubbles imploding on impellers, setting off ultrasonic shockwaves. The fluid-structure interaction from leaking pressurized fluids can also stimulate ultrasonic stress waves. Electrical arcing, corona and discharges are another possible instigator of ultrasonic vibrations. Naturally, these uncommon sources of ultrasonic vibration will contribute to DNA12 far more than DNA500. The graph above includes an undecimated vibration waveform, a DNA500 waveform and a DNA12 waveform. In this example, properly lubricated loading is evident, except from 49.7 to 50.5 milliseconds, when a slip occurred. During this interval, the DNA12 score exceeded 25 percent of the DNA500 score. This is when a brief speed adjustment took place. Negligible damage, if any, happened during this interval because it was a slip and not an impact or severe sliding event. This slip event was likely a rotation of a chain link. As mentioned previously, DNA500 is a peak-to-peak acceleration measurement waveform. It tracks forceful acceleration resulting from normal operation and process material movement from defect impacts and severe sliding contact. Fast Fourier Transform (FFT) analysis and correlation analysis of the DNA500 waveform can be useful for differentiating periodic and non-periodic events as well as for matching frequencies of occurrences with mechanical system movements. Intelligent decimation can extend the range of faults detected and expand the types of machines monitored. Traditional vibration analysis reveals problems associated with belt drives, bent shafts, cavitation, gear defects, looseness, misalignment, resonance, soft foot and imbalance. Oil analysis identifies problems related to lubricant chemistry, system contamination and component wear. With intelligent decimation, rubbing, severe sliding and slip friction faults can be detected while monitoring articulating, reciprocating and low-speed machines. Intelligent decimation can also be easy to implement. With simple computation, low power and narrow bandwidth requirements, it is suitable for long-life, battery-operated wireless sensors. These sensors can be easily mounted and automatically cloud-connected and configured. This allows any internet-connected computer or mobile device to become a monitoring and analysis interface for reliability specialists at any time or place. The I-DNA installation shown above detected the following operating conditions: intermediate shaft vibration peaks and sidebands; possible cage faults for intermediate shaft bearings; and intermittent, strongly modulated vibration. As shown in this example, intelligent decimation is able to monitor low-speed machines by detecting occurrence frequencies for high-frequency, metal-to-metal contacts.